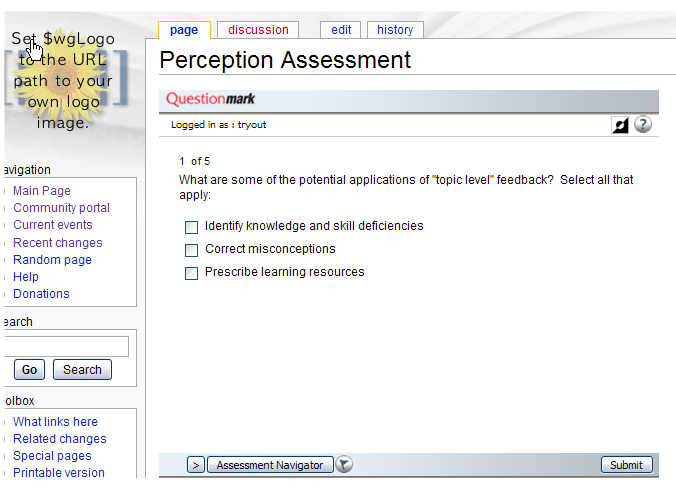 Embed a Questionmark Perception assessment, survey or quiz within MediaWiki. To see how this would look, see a snapshot of an assessment embedded within a MediaWiki page. MediaWiki is a free software wiki package written in PHP, originally for use on Wikipedia. Embedding an assessment into a MediaWiki page is possible provided the correct extension has been installed and configured. The correct extensions and configurations can be found in the How-to article mentioned above.